* christmas morning at home with the kids. * seeing family at the farm in Wales. * riding the big wheel at Winter Wonderland. * cupcakes from Hummingbird Bakery. * visits to London to see all the christmas lights. * dreaming about our holiday in the spring. * seeing the beautiful boy in his preschool nativity. * the good hair days she's had due to her new hairdryer and wand (thanks Mum and Dad). * the sheer magic of christmas morning with little ones. * his new pirate ship and green stripy socks. * singing songs from the nativity. * watching Father Christmas fly through the sky on Christmas Eve. * going to the farm. * her newly refurbished dolls house. * watching Minnie's Winter Bow Show. * singing and dancing to 'Shake It Off' by Taylor Swift. I actually have some far more picture perfect family photos from this month which I nearly shared instead of these three. Photos in a beautiful setting with lovely winter light. But I decided that I'll share them another day instead, and round off Me and Mine for 2014 with photos taken at the real high point of our December. Christmas morning is the bit when the magic of Christmas is at it's sparkliest, and while it may be dark and dingy for photos, and we may all look a bit bed-headed and sleepy, that magic sparkle just can't be dulled for me, because these photos are so full of the memories of that morning and how special is was. From the beautiful girl clutching her new toys, to us all modelling our Christmas pjs, from the bright lights of the Christmas tree, to the kisses and cuddles... that's what Christmas is all about, and we've had a December packed full of wonderful family memories which will last us happily until we get to make more next December. 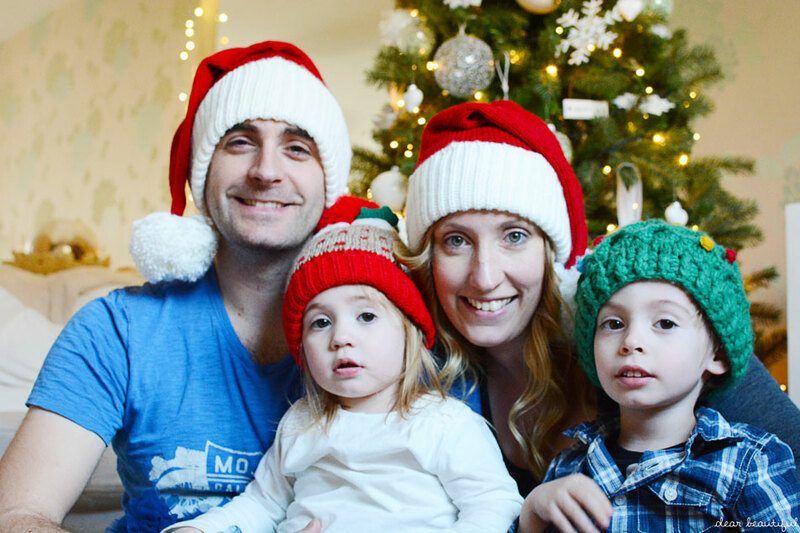 And then of course there is always the cheesy Christmas hats in front of the tree shot...! Which by the looks of it, Rich and I were enjoying far more than the children. 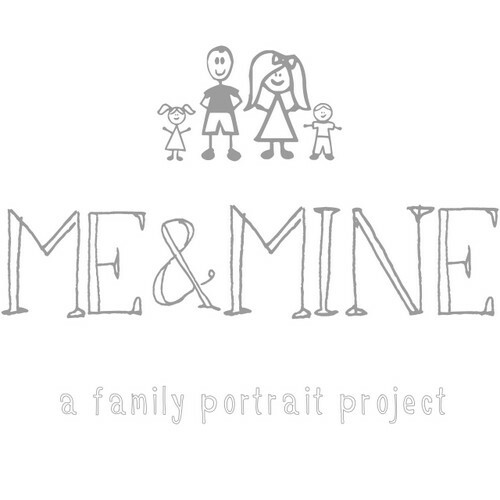 The end of December brings 2014 to a close, and it brings 2014's Me and Mine project to a close too. 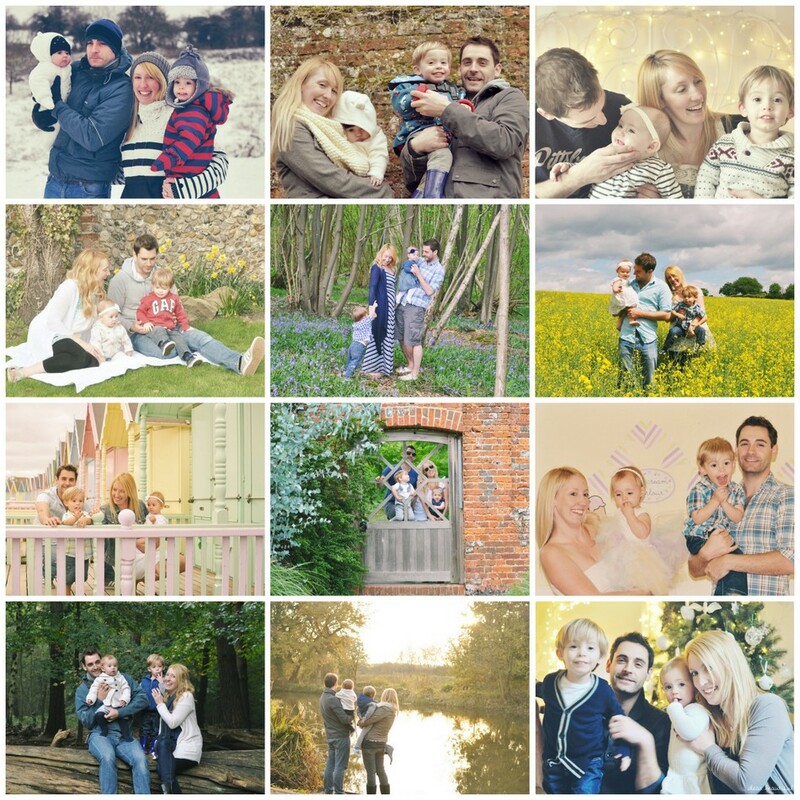 It's been a fantastic year for us, and yet again as I sit here looking at the family portraits we've compiled over the year, I'm reminded of how many lovely memories we've made to accompany these photos. And I'm also reminded of how glad I am that we take the time to take them each month, because they are, quite honestly, priceless to me. I hope in the years to come that we will all be glad to have a collection of photos of our family as we grew; and that it wasn't just pictures of the kids that Mummy took, but that we were so proud of our family that we loved all getting in front of the camera together. It isn't always easy, but it's always worth it! That really could be my Me and Mine motto. And two years ago when the idea first popped into my head I really couldn't have imagined that I would be about to embark on year number three of taking monthly family photos. But here I am, and I can't wait. I say it quite a bit, but I couldn't give up this little habit now if I tried, it's just too addictive. 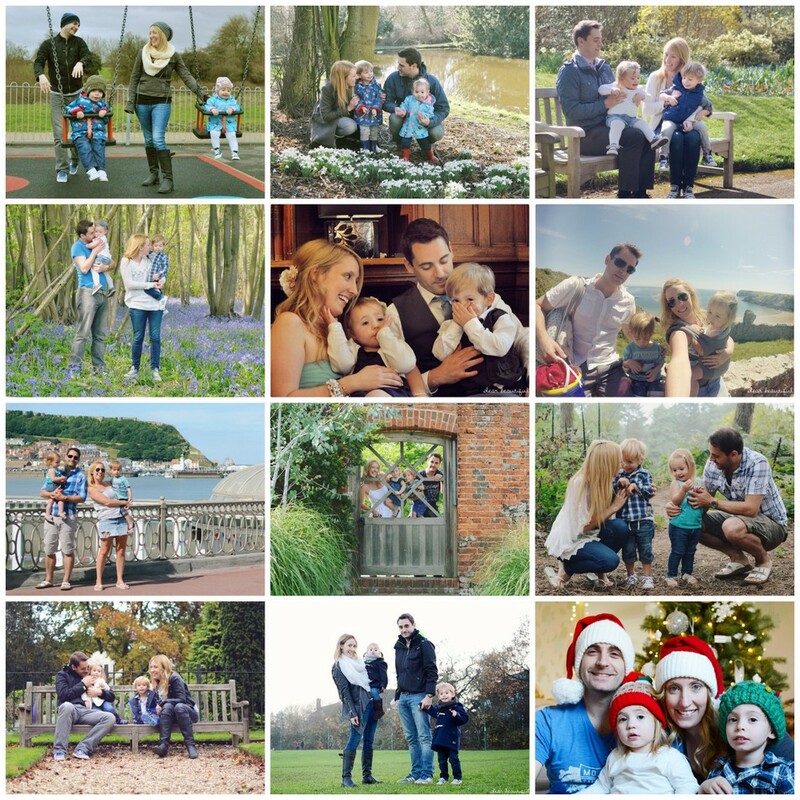 It's so clear looking at these photos all together, that this year our little lady really did change from a baby into a cheeky toddler, and that somewhere along the line, our little man lost that toddler-ish look and became a little boy. And if you'll indulge me a minute longer, the really big changes reveal themselves when I compare this year's photos with last year's... my goodness is the time flying while we have all this fun. Thank-you to each and every one of you who has linked up with Me and Mine at any point this year. It's the absolute highlight of my month clicking through the linky and seeing everyone's family photos. I hope lots of you will be back to carry on sharing your families next year too. Do go and check out my cohosts posts too; Katie at Mummy Daddy Me, Becky at Ar Blog, Lucy at Capture By Lucy and Lauren at Real Housewife of Suffolk County (who is stepping down as a cohost next year and we are sad to see go.) They will all have lovely family photos and stories to share with you. And they all deserve a big congratulations for doing two whole years of family photos, I know that I'm really proud of us all. 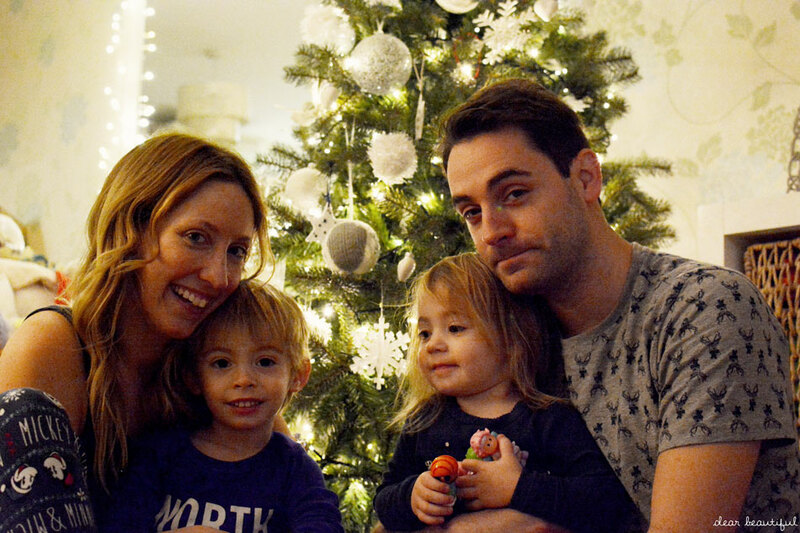 Now link up those lovely Christmassy family photos... I can't wait to see them! 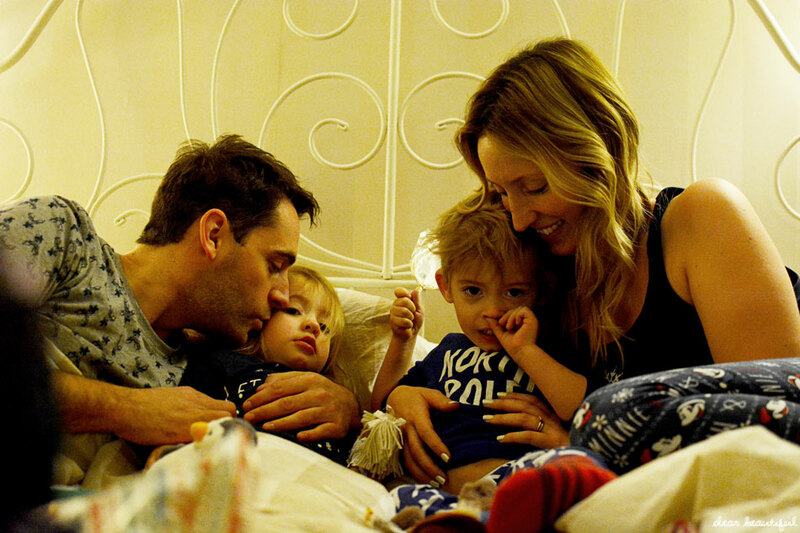 Oh they are lovely photos and definitely capture the magic of Christmas morning! We took ours on Christmas Day too and while they may not be the most technically brilliant I love that they are from Christmas itself. It's amazing seeing the changes in the beautiful duo over the last couple of years -roll on 2015, I couldn't stop now if I tried! Hahahaha, Christmas does make children hyper doesn't it? We would have stood no chance at my mum's house, but because it was a bit quieter just the four of us at home I managed to grab a quick opportunity. Thank you so much for this year. I have loved joining in and will continue to do so in 2015 to see just how much more my family changes. Lovely photos, they really capture the magic of Christmas. I am looking forward to making a concerted effort to join in with Me and Mine each month, it will be great to have a record of the year and the incentive to get the four of us in one shot! It doesn't matter how dark or sleepy anyone looks christmas photos in front of the tree are the best. I love them. So sentimental too! Love your Christmas edition of me & mine. What a beautiful way to end a great year. I have enjoyed watching your two little ones grow and (even getting the amazing pleasure to meet them) they are just as beautiful inside as they are outside. Love photos. I look forward to a whole another year of it next year. Thank you for hosting such a great project and making me concentrate on getting at least one photo of all of us each month! I am always in awe of your photography too! Just amazing! I love the sleepy morning photos, they are real treasures, you know how much I always want to take part in Me and Mine, I still am desperate for a family photo for our wall, even the renewal ones did not go to plan, so my aim for 2015 is that and to join in as much as we can. Such lovely photos. I'm so inspired by your complete collections from each year. Hopefully next year will be the one where I complete a full 12, and make the majority of them somewhere other than inside our house! Taken at the last minute! I can't believe a whole year has just passed — in the blink of an eye — but look at all of the lovely photos we have as a memento! These are lovely pics Lucy. Christmas is a magical time for children and adults alike. What a glorious year you've had! Looking at these, I'm thinking that you should have each set of 12 mounted and framed like that, so that everybody can see them - they are such lovely shots of your beautiful family. Such gorgeous photos but as you say, the most special thing is having them all, and watching those little changes that happen invisibly every month. Happy New Year! Just linked up for the first time, your photos are amazing and will be so lovely to loo back on over the years. The Christmas hat shot is such fun - what a nice idea. I must invest in a tripod so I can get some better Me and Mine shots. I loved looking at your past two years' worth of Me and Mine photos. They really give me the incentive to continue to join you each month in this great project. Here's to 2015!